Well, the Skoda Octavia Combi vRS offers a perfect blend of practicality and sportiness. It offers a spacious, comfortable interior whilst providing a stonker of a motor. Recently, Skoda Auto posted a new Guinness World Record using this sporty station wagon. We have seen people using their car’s sunroof for various purposes. However, in the mind blowing video we have here, you can see the sunroof of a Combi vRS being used for a very interesting reason. Basically, Markus Haas, a martial arts instructor stands through the sunroof of a Combi vRS and catches a flying arrow shot by Olympic archer Laurence Baldauff mid-air! What makes the video really interesting is that the Combi vRS easily manages to outpace a flying arrow and enables Markus to stop the flying arrow dead in its tracks. The Skoda Octavia Combi vRS used in this video is totally stock. It is powered by a 2.0-litre, turbocharged, four-cylinder engine that belts out 242 bhp of maximum power and 370 Nm of peak torque. All this power is sent to four wheels through either a six-speed manual or seven-speed dual-clutch transmission. The car can hit 100 kmph from standstill in just 6.6 seconds. 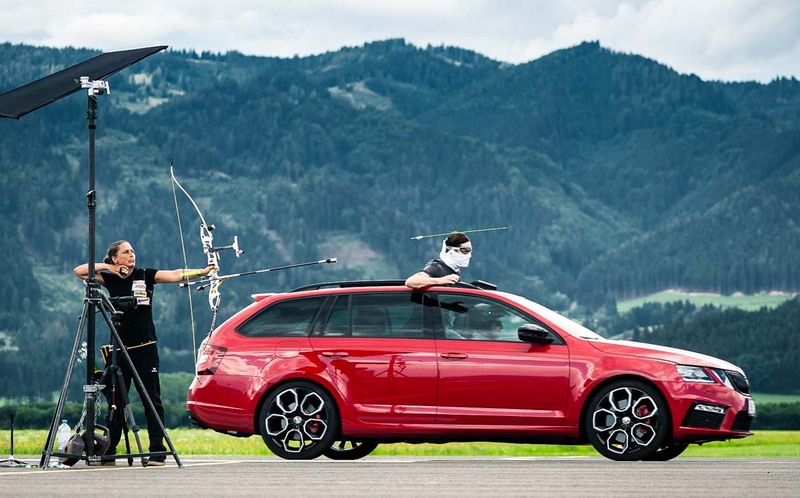 It’s really fun to watch the Skoda Octavia Combi vRS effortlessly outpacing a flying arrow that has been shot by an Olympic archer. While the Combi vRS isn’t available in India, the Indian car enthusiasts are lucky enough to have the vRS-spec sedan on sale here. In India, the Skoda Octavia vRS costs Rs 26.78 lakh. Its 2.0-liter turbocharged petrol engine produces a maximum power of 230 bhp at 5,500-6,200 rpm and a peak torque of 350Nm at 1,500-4,500 rpm. The engine comes mated to a six-speed DSG dual-clutch automatic gearbox that sends power to the front wheels through an XDS limited-slip differential.